The village of New Abbey is situated 6 miles from Dumfries in the shadow of the Cistercian Abbey built in 1273 as the daughter house of Dundrennan Abbey, some miles to the West. The driving force behind the foundation of the Abbey was Devorguilla, wife of John Balliol of Barnard Castle, the founder of Balliol College, Oxford. It is charmingly named the 'Abbey of the Sweet Heart' or 'Sweetheart Abbey' as it is the final resting place of Devorguilla and the embalmed heart of her husband. Devorguilla died in 1290. The local Maxwell family, based at Kirkconnell House, 2 miles from the village, kept the Catholic faith alive in the area during penal times. St. Mary's Catholic Church and priest's house, an unusual combined, integral building, was built within the precinct walls of the ancient Abbey in 1824. The man behind this mission was Thomas Bagnall, priest at Kirkconnell House from 1797 until 1822. During this time the then laird, James Maxwell refused to put money towards the New Abbey project as he felt the mission should be established in Dumfries "near to the playhouse". (St. Andrew's was built adjacent to the local theatre). Thomas moved from Kirkconnell to Kindar House, New Abbey, saying Mass in a chapel set up in the drawing room there. He journeyed round the country to raise money, beginning with supporters in his native Staffordshire. The architect chosen, Walter Newall, a local New Abbey man, became prominent in his profession, and today Heritage Scotland regards the building that is St. Mary's Church and House as "a gem". The house, Tudor in style, is a harled villa with hoodmoulded windows. The chapel forms a broad back (east) wing. The church was reordered in 1890. A new sacristy was added. Inside, at the west (liturgical east) end, a reredos of 1890, its Gothic, Austrian oak surround framing a copy of Raphael's Sistine Madonna, painted by the local artist J G McLellan Arnott, 1899. Stained Glass: in the south wall, a two-light window (the Crucifixion) of c.1905. In the north wall, a window (the Ascencion) signed by "Mayer & Co." of Munich c.1890. The very old Spanish Crucifix is particularly lovely. Built in the shape of a cross, the part that is the church is hidden from view from the road by the house. This was no accident. 1824 was before the Catholic Emancipation Act. Catholics still kept a low profile as the practice of their religion was technically illegal. A group of parishioners has been given permission by the Bishop to develop a spiritual centre at St. Mary's. 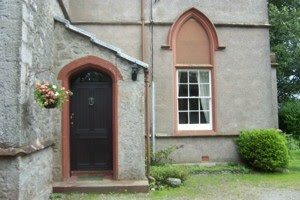 The house is available on an exclusive basis for those, individuals, or groups, or families, who wish to use the Centre for spiritual purposes, to rest and recharge their batteries. Priests especially are most welcome. Talks, retreats, days of recollection are arranged on an ad hoc basis when the Centre is available.